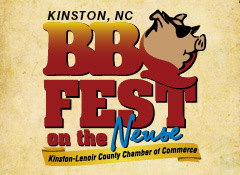 Award winning festival in Downtown Kinston. Largest whole hog bbq cook-off in the Nation! Chopped BBQ, Beer, Wine, Arts and Crafts, Entertainment, and so much more! Downtown area from the 100 to 400 blocks of Herritage Street, Caswell, Gordon and Blount Streets from Queen Street to Mitchell Street. More information and schedule will be posted.